Protective Packaging supplies Dallas area power company with a much needed cover for its backup transformer. Power plants are required to have a backup transformer on site to use in the event that the main transformer goes offline, needs maintenance, or experiences a catastrophic failure. 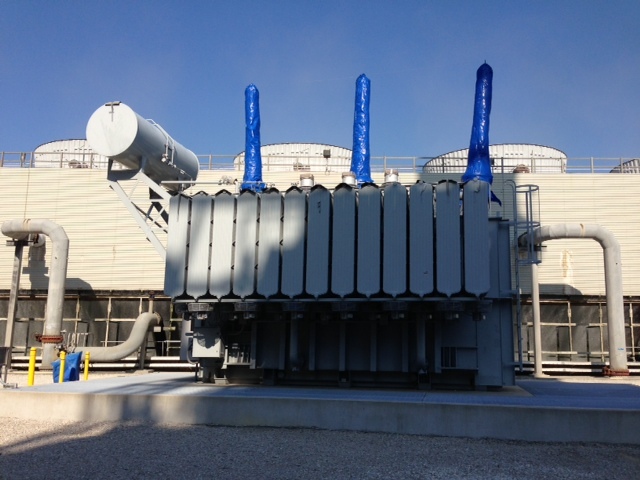 These transformers are roughly 25 feet high, 20 feet wide and 40 feet long. Due to the size of these transformers, they are generally stored out of doors and close to the active transformer so they can be moved into place fairly quickly when needed. Our customer stored their transformer on a concrete pad covered with a metal grate. After a few months, workers noticed dust and debris collecting on the transformer. Though this debris did not damage the internal workings of the machine, it would have to be cleaned off before the unit could be used. This buildup could cost precious time in the event of a power outage. The customer needed a cost effective solution to shield the transformer from the elements without having to relocate or otherwise move it. They also needed a solution that would come off easily and be reused if possible. Originally, they tried to shrink wrap the transformer, but winds in the area and the size of the unit made this task difficult to impossible. This meant the solution had to be some kind of flexible material that could be easily attached to the transformer. Because this was Texas, the cover had to be made of a material that would not peel, crack, or otherwise deteriorate in the blazing summer sun or the occasional ice storm. Ultimately, we recommended a heavy duty outdoor storage cover that would be attached to the transformer through the use of straps and buckles, to minimize debris build up, withstand high winds, and come off easily. Once we had customer approval on the solution, we set to work to deliver their custom cover. The design consisted of several panels of UV Proof Ballistic Nylon, designed to protect the transformer for at least 5 years. Our team then manufactured the cover to specifications, and dispatched packaging professionals to install the cover. We used a crane to position the panels around the unit, and workers secured the panels by tying them together with nylon ropes and fastening the buckles. Then the cover was fastened to the grate under the transformer using bungee type cords.